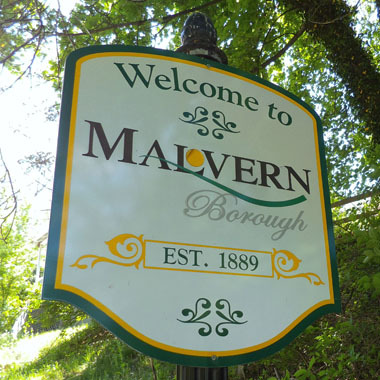 Borough of Malvern It is believed the township was named by the Pennsylvania Railroad in 1873, some 10 years after the Civil War, but it is not known whether the name choice came from the Battle of Malvern Hill, Virginia or directly from Malvern, England. The name is based on the Welsh for 'bare hill' similar to that of Malvern England. The area was originally settled by Welsh immigrants in the 17th century who bought land from William Penn. Today the buildings reflect the Victorian era when much of the town was built. The population is about 3,450. The following sequential pictures give a further insight into Malvern today. 1. Malvern greets you as you approach the town. 2. The horse drawn cart is a reminder of the past. 3. 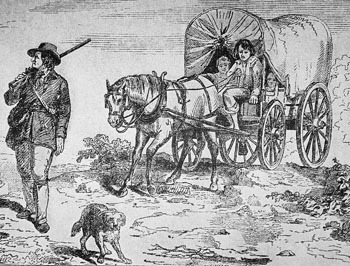 Early Irish settlers suffered a cholera epidemic which threatened their future. 4. The mayor David Burton shows envoy Bruce Osborne from Malverns Worldwide the railway station. 5. The train to Malvern arrives. 6. A Malvern Ambulance outside the National Bank of Malvern. 7. A typical street in Malvern. This is King Street, the Borough's main thoroughfare. 8. The historic Malvern Inn characterises the 19th century buildings. 9. Downstream of the springs to the south-east of the Borough, St Josephs in the Hills have created a religious grotto. 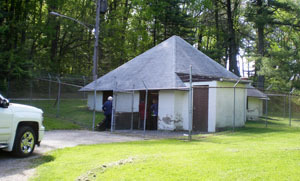 The springs were contained and were a principal water supply for Malvern. 10. The church spire on the crest of the hill acts as a focus for the Borough. 11. A street fair includes the Historical Commission stand where Lynne Hockenbury, together with Barbara Rutz and Kelly Schmitt promote Malvern's history. 12. An typical early spring house that survives, once a prime source of water. 13. Envoy from Malvern England Cora Weaver is spotted in this street scene. 14. Cora presents the letter from the mayor of Malvern England to David Burton, mayor of Malvern Penn. 15. A picture of Malvern England is presented to the Borough Council as part of an exchange of gifts with the Malvern Council in England. Malvern England received a state flag of Pennsylvania that had flown over the State Capital in Harrisburg on the 26 April 2017 on behalf of Duane Milne, PA House of Representatives. Other gifts received included books detailing Malvern's history and from State Senator Andy Dinniman, a book detailing the art in the State Capital Building (see our June newsletter for more details). 16. The mayor and Ira Dutter outside the spring house that could become a trial bottling works. Ira has forty three years experience of dealing with the locality. 17. Natural spring water flowing from the hills. The water finds its way eventually into the Delaware River at Philadelphia. Topography and the Springs and Wells of Malvern - The location of Malvern is on an east-west ridge to the west of Philadelphia. From a distance the hills look remarkably similar to the Malvern Hills in England and this was likely a factor in their naming. The Borough and the railway however are located on the crest of the ridge unlike Malvern England where the location is at the foot of the hills. Another feature that replicates England is the springs and wells. These occur on both the north and south side of the ridge and have been used for a variety of purposes including a public water supply. The seven springs to the south-east issued some 150,000 gallons per day and were once an important source of water for the town. The facility included a chlorine room and other purification facilities. They were shut down in 1990s. Where wells were sunk one such well at a depth of 300 feet proved to issue chalybeate (iron) water and was once pumped. Two water towers once stood on the crest of the hill near the town centre by the Catholic Church. These have now gone but were 85 feet high, each holding 85,000 gallons of local water. Further exploration of the springs and wells yields clumps of springs around the hills that are still in their original state, having not been contained for water supply purposes. It has been suggested that Malvern Water could be bottled at the former water works. (illustrated right) This lies to the south-east where the springs are already contained. This would probably mean piping the water to a suitable industrial site should a trial bottling operation prove worthy of extending. A pilot operation could be set up in existing buildings at the springs to test the concept. Should it prove successful the world renowned Malvern Water branding would be given a new lease of life, albeit in the US! Lincoln Highway - Malvern Pennsylvania is one of four Malverns that lie on the Lincoln Highway. This ancient route from New York to San Francisco is an amalgamation of wagon trails that became the first paved road for motor vehicles across the continent in the early 20th century. The other three Malverns from east to west are Ohio, Illinois and Iowa. Today we find that the interstate now provides a faster route for vehicles and many localities have become backwaters, albeit providing peaceful townships for modern day settlers. In the past however the movement of settlers west can be traced through the four Malverns. Malvern Iowa was named as a result of earlier connections with Malvern Ohio and Malvern Illinois similarly with Malvern Pennsylvania. In turn the origins of the earlier settlements can be traced back to the United Kingdom. Explorers of the Lincoln Highway today find many valued and preserved buildings and artefacts that illustrate this colourful past. Malverns Worldwide In May 2017 envoys Cora Weaver and Dr Bruce Osborne from Malvern England came to Malvern Pennsylvania extending the hand of friendship between the two Malverns. The visit included a presentation about Malvern England to the Council and citizens. This was followed by a historical tour masterminded by the local Historical Commission. Sites visited included the Malvern Paoli Battlefield and the History Centre. Symbolic gifts and letters from each town were exchanged to provide permanent reminders of the occasion. For further information on Malvern go to the official web site by clicking website below. Alternatively read more on Malvern Pennsylvania in our newsletter by clicking right.